I love my bathtub. I have made long term living decisions based on the desirability of the tub. In fact, I agreed to our present house because of the garden tub. A GARDEN tub is one that you can sink into comfortably when you are 12 months pregnant. Much like I was with Emme, when we moved here. It has been my refuge, my place of respite, a welcome relief from the insanity that is my house. This morning I stumbled into my bathroom for my morning soak. Which can last anywhere from 45 seconds to 20 minutes, depending on the level of chaos in the rest of the house. And I was greeted by a gigantic green filled water balloon. It was so enormous that I couldn’t even lift it out of the tub. I was forced to share my morning soak with the enormous green water balloon. 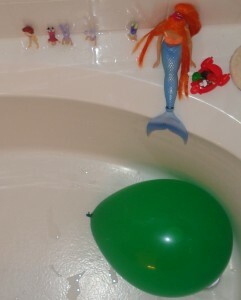 Because I knew that the balloon was the prized possession of one 4 year old, who has lately commandeered my tub. And since for medical reasons he has to sit in a tub of tepid water at least 20 minutes a day, we try to make it as pleasant an experience as possible. And if you must know, I have been known to serve him his dinner during his soak. So, are you a bath or a shower person? And for your reading pleasure, my girlfriend Diana sent the following to me. I have no idea who wrote it. I just know that whoever she is, she is my people. Don’t panic if I’m not out right on time. I’ve heard that people don’t dissolve in water and I’d like to test the theory. While I’m in the tub, I’d like you to remember a few things. The large slab of wood between us is called a door. Do not bang to hear my voice. I promise that even though you can’t see me, I *am* on the other side. I’m not digging an escape tunnel and running for the border,no matter what I said a while ago. I didn’t mean it. Honest. There will be plenty of time later to tell me about your day. “Later” means at a time when I am no longer naked, wet, and contemplating bubble gum in the blow dryer. I know you have important things to tell me. Please let one of them be that you have invented a new way to blow bubbles, not a new way to add gum to your hair. Believe it or not, shouting, “TELEPHONE!” through the closed bathroom door will *not* make the phone stop ringing. Answer it and take a message. Since Amazing Mind-Reading Mom has the day off, you’ll need to write that message down. Use paper and a pencil. Do not use your brother and the laundry marker. We can’t send him to school with telephone number tattoos. Water makes me wet, not deaf. I can still tell the difference between the sound of “nothing” and the sound of a child playing the piano with a basketball. I can also hear you tattling at the top of your lungs. I’m *choosing* NOT to answer you. Don’t call your dad at work and tell him I am unconscious in the bathroom. He didn’t appreciate it last time. He won’t appreciate it more this time. Trust me. No matter how much I would like it, water does not make me forgetful. I remember who you are and why you are grounded. No, you can’t go to Shelby’s house to play. No, you can’t go to Shelby’s house to use the bathroom. If someone is in our other bathroom, you will just have to think dry thoughts and wait. Unless you have four feet and a tail, do not think of going outside to “water” the lawn. I know the dog does it. The neighbors don’t feel the need to call me when the dog does it. Unless the house catches on fire, stay inside and keep the doors locked. Do not go outside and throw rocks at the bathroom window to get my attention. I know it works in the movies. This is reality, the place where people don’t like to sit in a tub while rocks and broken glass rain in on them. Do not set the house on fire. Call me if there is an emergency. 1. Dad has fallen off the roof. 2. Your brother and/or sister is bleeding. 3. There’s a red fire truck in front of our house. 1. Dad has fallen asleep. 2. Someone on TV is bleeding. 3. There’s a red pickup truck in front of our house. One other thing: Being forced to use the last roll of toilet paper for a towel does not make me happy. It makes me sticky with little white polka dots. In the future, when the tub overflows, use a mop to clean up the water instead of every towel in the house. For my sanity’s sake, let’s pretend it was the tub, Okay? No, I don’t want to hear the real story. Ever. Especially not while I’m standing in the pool of water you missed. By the way, all Play-Doh experiments are hereby canceled. Be good. Entertain yourselves. Yes, you can do both at the same time. Try coloring, playing a game, or paying that stack of bills on the coffee table. I’ll be out soon. Maybe. I’m a shower person. Never did like baths. you avoided catching that nasty bug again? makes me want to wash everything…. I am a bath person, too. We have an old, cast iron, claw foot tub and I love soaking in it. The email you posted is absolutely hilarious. And so so true most times with little ones in the house. Shower person all the way. That re-post is hilarious! I’m a shower girl. The longer, the hotter, the better. 😉 Although, with two boys and another on the way, it’s often short, sweet and to the point. A girl can still dream, right? 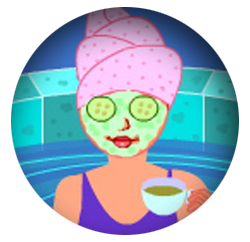 I’m a shower girl unless I’m stiff and sore from overworking (or, you know, that “special time”) or sick with a chest cold. then I like to run the water as hot as I can stand and soak. Occasionally I like to soak just for some “me” time, but usually I save the tub for needed soakings. Which reminds me, it’s time to go get that morning shower…. Here lately I am a shower girl but that is only because said plumber cannot find why we only have hot water to the bath tub for short amounts of time. I think whoever wrote this story stole my life! HA! I also bought our house because of the big “garden” tub. Next time a house says it has a garden tub GET IN IT. My “garden” tub looks big to the eye, but it is SO shallow I can’t get all wet at once. I’d much rather have a narrow DEEP tub than a shallow WIDE tub. Sigh. I still like baths but mine has been dusty since having the twins. I do get to get in it occasionally but when you have to dust the tub in order to soak, it looses it’s appeal. Ahhhh a nice bath – what I wouldn’t give for a nice tub. Here in Mexico bath tubs are rare. We had to have someone build a tub in our bathroom just so we can bathe our kids. It is made of tiles so it is not always very hot. It is a square so you can fill it up a lot but you would run out of hot water if you tried that. You cant even think about leaning back and relaxing because your back would freeze! Maybe our next house can have a nice tub 🙂 They really are soooo nice! I LOVE baths! We had a gorgeous, deep, and long tub in our London flat and it’s one of the *million* reasons I miss it so much! My new house has 2 tubs and I swear they are for children under two! I have to pick whether I want my knees, feet or shoulders under the water at any given moment because not all will fit at the same time. Now I make hotel decisions based on the bathroom. My husband makes fun of me, but I am soooooo happy if I can just soak with a book and a glass of wine for an hour on vacation. Shower, girl! I want my yuckiness to go straight down the drain once it leaves my body! I’m not a bath-lover (I only do showers), but I was laughing so hard reading that my husband came in the room to ask if I was ok. I guess he thought I was crying. Well, maybe I was, but it was the laughing kind. I can do with both. We have a great shower head I installed myself. That story is the story of my life. I’m a bath person. I love to go swimming but when I need to get clean I want a shower. Now my husband he could do both and has been known a time or two to come out of the bathroom smelling like Vanilla Lace bubble bath from Victoria Secret! Shhh don’t tell him I told you that! Our whole house is bath people…we will all take quickie showers to get clean because we don;t have time, but we are BATH peoples and all understand the bath rules. Tanner could soak for HOURS and usually stays in from the time he gets the hottest water he can stand till it gets so cold his lips are blue. C even values a good soaky bath. I have even been known to take my quicky shower (perm hard to wash in tub) then to get in the tub to enjoy it. Showers are my usual way of getting clean. A bath is well loved for relaxing and/or hiding. 🙂 I loved that re-post. Sooo funny! Oh, DeeDee! Someone needs to write another version of that bath letter aimed at husbands who are caring for small children while their mother soaks. I am a bath person. I have vetoed buying more than a few wonderful houses because their bathtubs did not give a friendly vibe to me. The house that we are hoping to buy now has no garden tub, but has room for one, and that is my TOP priority if we get to move in.